I’ll never forget the first time I had pumpkin cupcakes. It was around Christmas several years ago, and my sister-in-law made them. When she told me what kind of cupcakes she made, I grimaced. Pumpkin? That can’t be good. I thought to myself. Boy, I was SO wrong. I couldn’t stop eating them, and have made them MANY times since then. Preheat oven to 350 degrees. In a medium mixing bowl, combine butter and sugar, beat with electric mixer at medium speed until creamy. Add pumpkin, egg, and vanilla, continue mixing until smooth. In a separate smaller bowl, add all dry ingredients. Gradually add dry ingredients to mixture, and continue beating until well combined. Using a cookie scoop, place on cookie sheet or baking stone. Bake for 15-20 minutes, or until a very light golden brown on top. Cool cookies on cooling rack. combine all ingredients in small mixing bowl, and stir together until your desired consistency. You’ll want it to be thick, but runny. Dip completely cooled cookies one by one into icing. place back on cookie sheet for icing to set. Store in airtight container. *Add some extra zing to these cookies by throwing in a bag of cinnamon chips or mini chocolate chips! 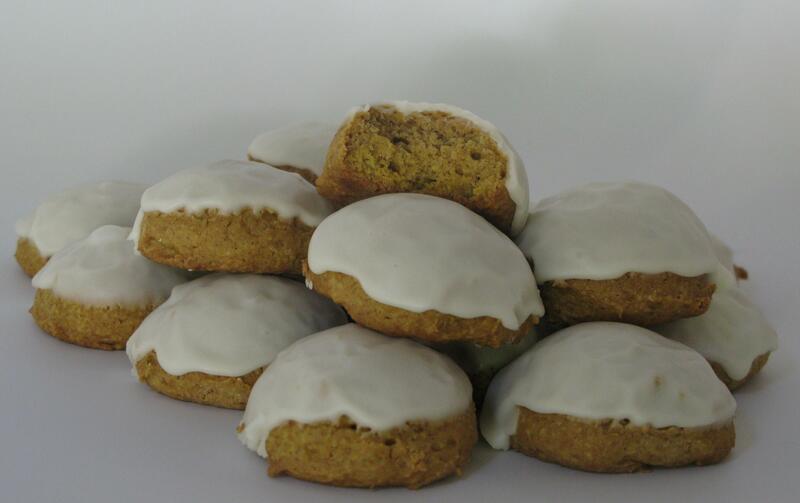 I have Joan today and we made your pumpkin cookies-yum! !